Folder "Take pleasure in heating"
The ASKOCONSOLE-WALL is designed for easy installation on any conventional buffer tank to provide the user with energy-efficient, smooth, high-temperature stratification. To this end, the ASKOCONSOLE-WALL can be connected directly to the relevant buffer tank in new buildings or refurbishments. 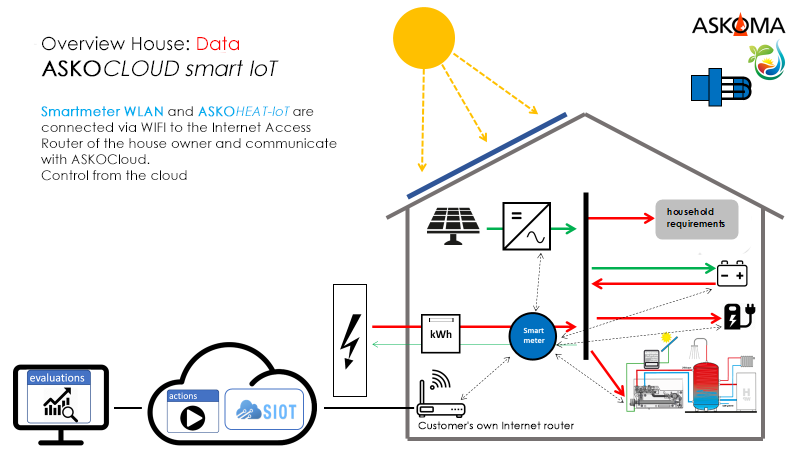 ASKOCLOUD offers an easy entry into the SmartGrid / SmartHome world. An IoT-compatible heating insert and a smart meter, which is integrated in the meter cabinet, are supplied with this. These two components communicate with the cloud via LAN or WLAN. The cloud receives information from the smart meter about the amount of excess electricity that is currently to be fed into the public grid. 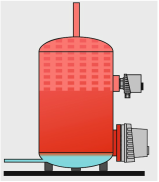 The cloud transmits to the IoT heating insert which of the seven stages it is to heat to convert the maximum excess electricity into heat and store it in the heating buffer tank. ASKOMA has a range on stock again. Equipped with a temperature control and a double-pole safety temperture limiter, the application of rod thermostats ASKOSTAT-ROD for hot water boiler as well as warm water tank is possible. Additionally a horizontal and vertical installtion is possible. A compact design , the long life time (cycles of operation) as well as a simple installation makes the rod thermostat price effective and a practical component for measurements and protection of the warm water boiler or -treatment. The corresponding data sheet you find here. If you need further information about our rod thermostats or other ASKOMA products, please don't hesitate to contact us. As an absolute highlight we can present to you our IOT-solutions. In addition to wireless visualisation and control of thermostats and heating elements, we will show you our possibilities of wired analog and digital interfaces on our products. Now there are no more obstacles to a connection with SmartGrid & SmartHome! (IoT = Internet of things). Our screw-in heater ASKOHEAT is now available with insulated mountig of the heating tubes, so the boiler with the heating element is electrically insulated. Now the usage of this product in an enamelled boiler won't be afflicted with corrosion problems anymore. Our electro mechanical thermostats ASKOSTAT are now obtainable with temperature compensation. At higher ambient temperatures than the calibrate temperature the set value doesn't have to be corrected. The precision of the temperature measurement is equivalent to the electronic thermostat. The flange heater with ceramical heating elements experiences a drowning resurrection. We now have expanded our proudct range with a new product line called ASKOHEAT-FK with a power range from 10 to 45 kW. A very low surface load of 3 W/cm² prohibits a calcification of the heating tubes almost completly. A defective heating element can now be removed without drainging the tank. A new dimension in the maintainance and service field! Convince yourself of our innovations and extensively marketed own brands like ASKOHEAT, ASKOSTAT, ASKOTRONIC and ASKOCONTROL. Our team on site is looking forward to advising and informing you about our products, solutions and services. Do you require admission passes or an appointment with us on site? So don't hesitate to contact us now. and -control ASKOTRONIC from ASKOMA have been developed - multifunctionally deployable at attractive prices. The product line ASKOTRONIC is characterised by the variety of installation options such as mounting on pipes, walls, air ducts, or immersion tubes. From a technical and economical point of view the large number of product variations as well as customer-specific modifications, even in small quantities, are advantages, making the use of an electronic ASKOMA-thermostat very interesting. Of course you will receive our products from production site in Switzerland in the accustomed ASKOMA delivery and product quality. We’re looking forward to discussing your advantages in using an ASKOMA ASKOTRONIC. The efforts for services and a long life time are key factors in applying a suitable heating element. But also ingenious electrical and mechanical connection features are of profitable use. As a result of the insulated assembly of the heating elements using protective current bleeder, ASKOMA flange heaters prevent premature aging due to tank corosion. From a technical and also from an economical point of view the big selection of product types as well as custom-made adaptions even with small quantities makes the use of an ASKOMA flange heater very interesting. 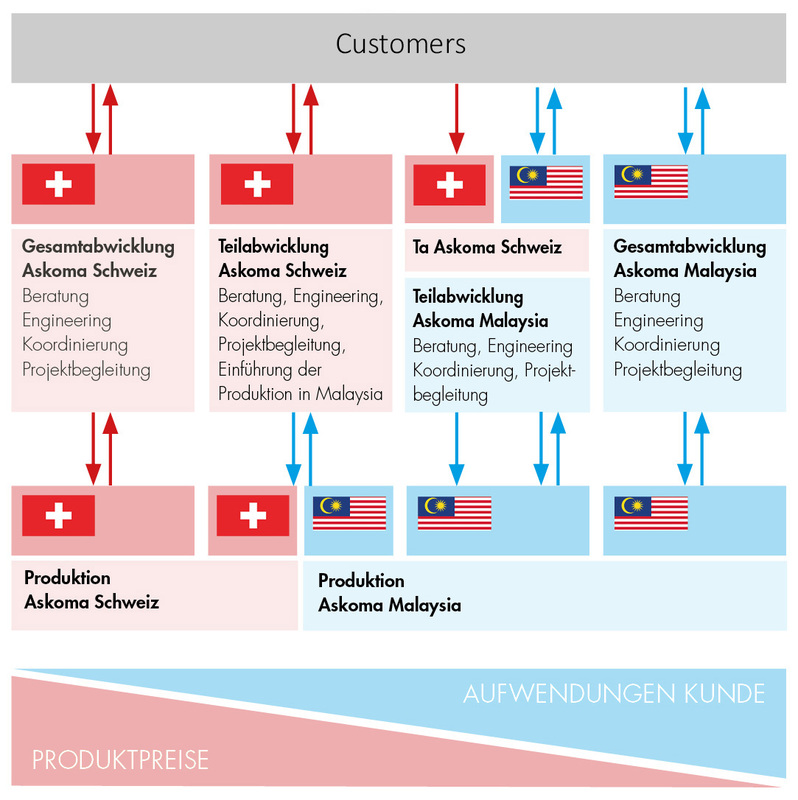 This you receive from the manufacturing facility in Switzerland to the usual high ASKOMA quality on delivery and product, particularly due to a 100 % pre-deliver inspection for tightness and insulation value. We’re looking forward to discuss your advantages in using an ASKOMA ASKOHEAT. After the launch of the ruling EN 60335-2-21, tanks or boilers with electric heaters are considered as a cohesive system. It is stipulated, that the standard specifications has to be complied with the combination tank <> electric heater. This verification is time-consuming and connected with significant costs. Several national testing institutes conduct this combo verification, but time and charges can only be planned to a certain extent. Within the collaboration with tank manufacturers ASKOMA has installed an especially accredited testing system in CH-Bützberg. We can offer and perform tests according to EN-specifications, wherefore only ASKOMA heaters will be applied, at attractive time and cost conditions. Are you developping a new storage range or would you like to test your current product line? We will gladly submit to you an offer for an efficient, cost-effective check with all official certificates included. ASKOMA ceramic heaters, Type ASKOHEAT-FK makes it possible again. ﻿The comeback of a well-tried technology. For the flange and the heating tubes, stainless steel is applied. The surface load of the heating tubes is less than 3 W/cm² and the power range lasts from 10 to 45 kW. ASKOHEAT-FO with a flange-diameter of 280 mm. Go for ASKOMA-electric heaters - ​it will be worthwhile! Since the day we launched our own specially developed electric heaters branded ASKOHEAT, ASKOMA AG constantly worked on improvements of product quality and user-friendliness. Today we can include product features, which are not available in similar products. These are evident andvantages in installation into the tank and electrical connection, as well as operational reliability and longer life time. ASKOHEAT-S are listed and described. If you need further information about our products, don't hesitate to contact us.